On October 8th, I had been awaiting word from the small October 6th CME, due to arrive between the 8-9th. All day, I had been updating the data from Solarham, along with getting reports from some of the guys over at the Alberta Aurora Chasers group on Facebook. By 9:30 pm, it seemed that the CME had arrived. With the weather over Edmonton mostly cloudy, I didn’t put too much thought into getting out and shooting the potential show. In between cleaning the condo, packing for work, and editing images from my trip to Mount Assiniboine earlier in September, I kept poking my head outside to check the cloud cover to the north, while updating all of the weather apps on my phone. Around 1:30 am there was not a cloud in the sky, and from my balcony I could see the aurora with my naked eye. I have always wanted to shoot the aurora over the Edmonton skyline and figured it would be a good opportunity to do so, as I didn’t want to travel far because I was flying out to work at 7:00 am on the 9th. With my batteries fully charged and empty memory cards in the bag, I grabbed my gear, loaded up the 4runner and headed towards Gallagher Park which is right close to the Muttart conservatory. I was originally hoping to shoot the skyline with the pyramids in the foreground, but for some reason, the lights were turned off. So I had to change up my vantage point and decided to head a little farther west on Connors Road. There I found a clear view of Edmonton and set up my camera. The first images on the back of my LCD screen showed a lot of blown highlights from the city lights when exposing for the aurora. So what I did was screw my filter holder onto the 24mm 1.4 Bower lens and insert a soft 3 stop GND filter to tone down the city lights. I was able to stop down to f/4 from f/1.4 and shoot at ISO 800 while maintaining a shutter speed of less that 5 seconds. Shooting with these settings allowed me to ensure that the aurora movement was relatively frozen, instead of a green blob, and also retain a lot of detail in the buildings. And with these settings I was able to get some nice “star effects” from the street lights. Written by Mike Isaak, posted on October 11, 2013 at 8:39 am, in Alberta, Aurora, Edmonton and tagged alberta, aurora, edmonton, long exposure, night photography. Permalink. RSS feed for this post. 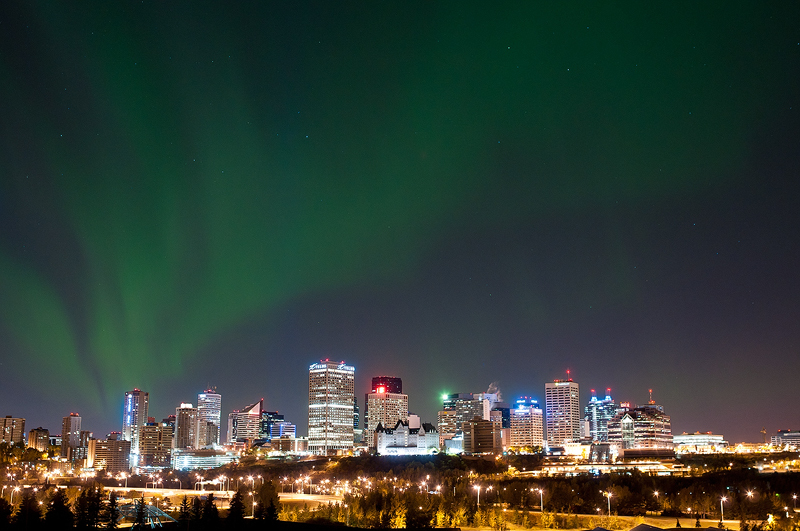 « Edmonton Skyline – June 19, 2013. You may recall that I’ve previously, under my personal twitter account, forwarded one of your photos to Phil Plait. 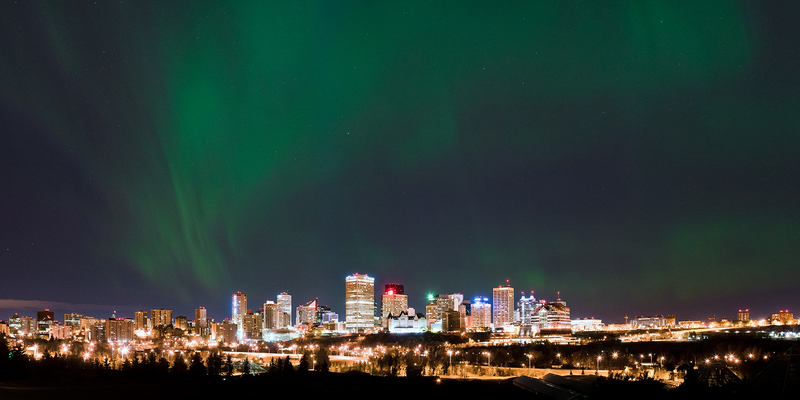 I so love both Edmonton Aurora and City Lights that not only will I be wanting to buy large prints of both I would love to purchase a digital copy of one or the other to make use of as the background on my new company’s twitter @firstflightfilm . I only just started my company this past week and we are just in the building stage but both of these pictures so perfectly capture the image I want to project for my company “a Canadian film studio that is reaching to the heavens” that I doubt I could have gotten a more perfect image if I had contracted for it – save perhaps contracting you. Please e-mail me at the e-mail above or call/text me at (780) 264-9508 to let me know what your pricing options would be and whether you think that there may be other images or photos I should consider. If you check my twitter feed, the main logo is currently being prepared by a good friend of my wife’s husband. That logo will likely feature a stylized picture of a snowy owl in flight if that helps spark some other options for you to show me that I had not considered. I would, of course, credit you as the photographer who took the shot we would use on the twitter background and include (not quite sure how beyond an initial tweet or a link on the website to follow – where I would also like to use the digital copy I want to buy). If that sort of cross promoting can get me some sort of discount on the price of the digital copies I would not stop you but in a demonstration of my sad, sad negotiating skills I will still include the links back to your work regardless because, well, it is absolutely breathtaking. I should just stop here (as I need to walk the dog) but I am wondering if you are a full-time photographer or if this is just a part-time gig for you? You have a fantastic eye and, as we are just starting up in a medium that is all about images, I was wondering if you might be open to me buying you a coffee or beer (or 2) to pick your brain about composition and looking at the world with a photographer’s eye. I am a lawyer by profession and this new venture is a real departure from that (I am still keeping my day job while I get started – some nice tax advantages open to proprietorships in the early stages of a business) but one of the things I learned over the last 15+ years in Law is that the more information you get, from the more people, the more complete picture of the puzzle you end up having. Anyhow, look forward to hearing from you soon.